Female desert tortoise resting on the apron of her burrow about to get a power plant built on her doorstep. (2010) © Michael J. Connor, Ph.D.
Scientists have long recognized that the wide range of the threatened desert tortoise includes a number of distinct populations. 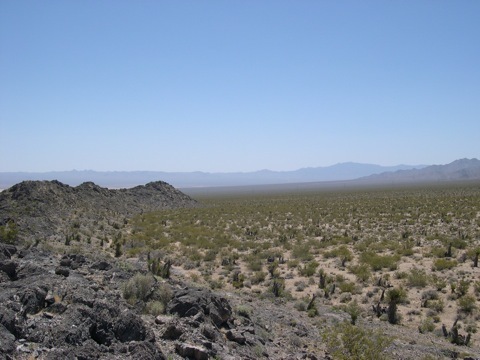 The Ivanpah Valley is the only place in California where the Northeastern Mojave desert tortoise population occurs. These tortoises are the most genetically distinct of the California populations. 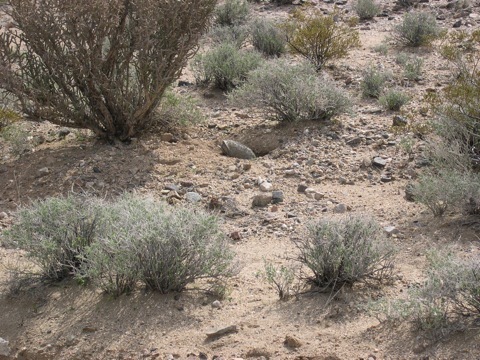 The North Ivanpah Valley desert tortoises are recognized as one of the highest elevation breeding population known and the area provides essential habitat connectivity to the mountain passes to the Eastern Mojave desert tortoise populations in the neighboring valleys. The Ivanpah power plant and other industrial scale developments will severely impact this key Northeastern Mojave population in California, and as such poses a threat to the entire listed population. The North Ivanpah Valley is entirely the wrong place to build a massive, experimental power plant. Western Watersheds Project and other conservation groups intervened in the California Energy Commission’s licensing process for this poorly located project. Despite testimony to the contrary, the Commission ignored the science related to desert tortoise, issued findings of “overriding concern” with respect to biological, visual and other concerns, and voted to license the project. 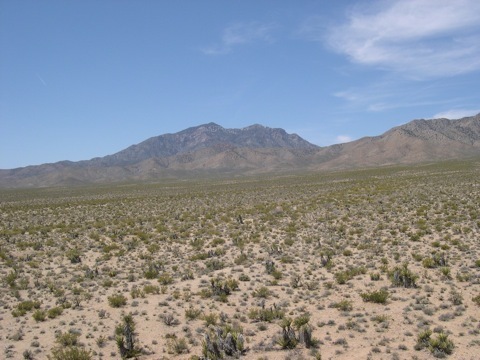 Part of the Ivanpah power plant site with Clark Mountain Wilderness in the distance. (2009) © Michael J. Connor, Ph.D. But there are alternatives to this project. Experience shows that encouraging conservation and efficiency is the most effective means of reducing energy use not building new power plants. There are degraded private lands where “green” alternative energy power plant projects could be built. There are other possible sites such as dry lake beds that could better recover once the solar power plants built on them are deemed obsolete, which they inevitably will be. Photovoltaic technology is improving in leaps and bounds making roof top solar and other distributed energy options much more efficient and cost effective. The environmental review for the Ivanpah power plant was simply propelled by the $1.4 billion in tax payer money. Western Watersheds Project firmly supports the role of science in making sound decisions on uses of our public lands. The Environmental Protection Agency’s analysis of records from land stations and ships shows that the global mean surface temperature has warmed by about 0.9°F since 1880. This warming is predicted to accelerate as greenhouse gases generated by 6.9 billion humans accumulate in the atmosphere. Unfortunately, building the Ivanpah and other power plants is not tied to closure of any of greenhouse gas belching power plants. The agencies argue that somehow these plants will result in loss of dirty coal and gas plants through competition. Unfortunately, if anything reducing energy costs is more likely to result in increased energy use. In the rush to initiate yet another techno-fix that benefits private corporations the agencies have failed to take a critical look the environmental impacts of these projects, and sacrificing public resources without the benefit of a long term strategic view. Human response to climate change does not require the wholesale sacrifice of precious public lands and important resources, rather these resources provide insurance against climate induced environmental catastrophe. Secretary Salazar’s quick-fix approach is neither clean nor green. 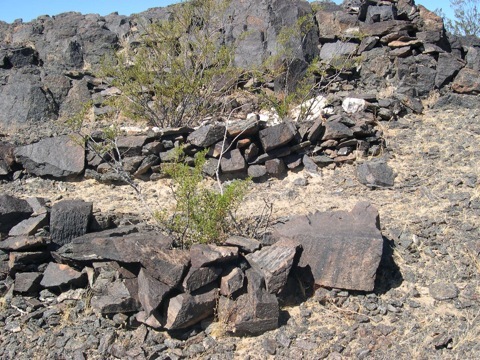 Unusual Native American stone structures slated to be surrounded by the Ivanpah power plant. (2010) © Michael J. Connor, Ph.D. It sounds like this is a done deal. Any chance of commenting to DOI or does that seem to be a waste of time? It’s is a done deal from the standpoint of public input. Secretary of Interior Salazar will be there to sign the ROD (Record of Decision). This makes it a full Interior Department decision, not a BLM decision, a signal of strong backing by the government of the project. The project begins immediately. Tortoises will gathered up immediately and deposited over the fence. Any opposition must immediately go to federal district court. There are no lower stages of appeal. Is there anything that can be done to STOP this? It should be stopped immediately. The L. A. Times ran a story on it in 10/23/10 paper showed the grader trying to grade the area and a biologist trying to catch a tortoise. I think they have made a big mistake here.